I don't like making sympathy cards, however, they are a necessity for card-givers like me. I've learned lately to keep at least one on hand at all times. There are times when you want your card to arrive in a timely fashion or you wish to be able to drop one off with flowers at short notice. I hadn't used my Flourishing Phrases set much and I got this new Detailed Floral Thinlits dies recently. WOW. Packs a punch without much effort on my part. I chose Basic Black, Basic Gray, Whisper White and Silver Foil paper and I think it's very elegant looking. I accented some of the flowers using Metallic Enamel Shapes and *free* ribbon from Sale-A-Bration. I'm glad you stopped by today. Won't you leave me a comment? I love reading each one. 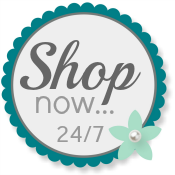 Please use my Online Store to purchase you own Stampin' Up! products.